Snooper S600 Syrius Plus satellite navigation and speed camera warning system, provides street-level mapping of the UK and Western Europe via a super bright 4.3-inch widescreen view. The Snooper Syrius S600 Plus also features 2D and 3D directional prompts, full 8-digit UK postcode search, multi-route planner and Bluetooth technology providing hands free calling, for safer in-vehicle calling. Snooper S600 Syrius Plus will provide alerts to speed cameras in the UK and Europe via the AURA speed camera database. Snooper AURA speed camera subscription - £2.99 a month, £7.99 a quarter or £29.99 a year. Map update will be sent separately direct from manufacturer. Snooper S600 Syrius Plus has been discontinued. Accessories, spares and parts are still available for your S600 Syrius Plus. Snooper S600 Syrius Plus Western Europe satellite navigation system includes maps of Western Europe including UK, Ireland, France, Spain, Germany and Italy. The Snooper S600 Syrius Plus also features the award winning AURA speed camera database which, unlike most other sat nav systems, is updated on a daily basis. This allows you to update your Snooper S600 Syrius Plus as often as you wish, safe in the knowledge that you can download data providing the latest speed camera locations. Syrius Plus gets you effortlessly from A to B whilst ensuring that you get there with your licence intact. Snooper S600 Syrius Plus with AURA speed camera database offers European protection. Included in the Snooper S600 Syrius Plus are locations in Germany, Holland, Belgium, France, Spain, Portugal, Switzerland, Ireland, Italy, Austria, Luxembourg, Denmark, Norway, Sweden, Finland, Poland, Romania and United Kingdom (subscription applies). Snooper S600 Syrius Plus features unique Multi-route planning software. Multi-route allows you to calculate a single route around up to 10 different destinations just by adding the postcodes. No stopping and starting, struggling to find each and every address. Your complete route is calculated and saved in just a few seconds. Stay on the right side of the law. The Snooper Syrius S600 Plus is equipped with Bluetooth Handsfree technology so that if you do have to take a call whilst you are on the move you can do so safely, with both hands still on the steering wheel. Also available as an optional extra is an extension microphone perfect for vehicles which generate a lot of background noise. The external microphone can be installed permanently or temporarily and ensures that you will always be heard clearly. The external microphone can be purchased separately for £9.95 inc VAT. 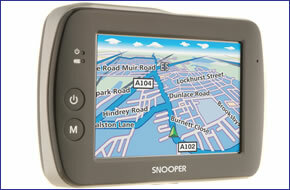 View the complete range of Snooper S600 Syrius Plus accessories and maps. Unlike AURA, many other GPS databases rely largely on locations provided by hobbyists who might not be able to tell a speed camera or a red light camera from a traffic flow camera or a surveillance camera. These databases could result in annoying false alerts, which could lead you to start ignoring even legitimate alerts -defeating the point of having a GPS database in the first place. In contrast, Snooper has assembled a professional team that devotes every working day to verifying each and every speed camera and high risk zone that goes into the AURA database. As well as the UK and Ireland, the AURA speed trap database offers European protection. Included in the Snooper S600 Syrius Plus are locations in Germany, Holland, Belgium, France, Spain, Portugal, Switzerland, Ireland, Italy, Austria, Luxembourg, Denmark, Norway, Sweden, Finland, Poland, Romania and United Kingdom. The AURA speed camera database incorporates shared mobile Police positions, Gatso cameras, Truvelo cameras, SPECS cameras, DS2, Speedcurb, Watchman, Multi Lens Gatso, Accident Blackspots, Mobile Laser Sites and High Risk Zones. Plus the AURA database includes the speed limits at all these locations so your Snooper S600 Syrius Plus can count down accurately to the hazard! Snooper AURA speed camera subscription charges for the Snooper S600 Syrius Plus is available via the following 3 options - £2.99 a month, £7.99 a quarter or £29.99 a year. The Snooper S600 Syrius Plus is mounted on the inside of your vehicles windscreen using the suction cup windscreen bracket provided. The Snooper S600 Syrius Plus can be powered directly either from its internal battery if it's fully charged or powered from the cigarette lighter socket. Recognised as the industry leader in digital street level mapping, Snooper S600 Syrius Plus Western Europe uses NAVTEQ map data. Ensuring you are taken seamlessly from A to B on the best possible route with full UK 8-digit postcode search. To ensure the most accurate postcode search available Snooper S600 Syrius Plus uses Ordnance Survey, the most comprehensive of it's kind. Snooper S600 Syrius Plus Western Europe provides full street level mapping and points of interest for the following western european countries: UK, Ireland, Denmark, Norway, Sweden, Finland, Germany, Austria, Switzerland, Holland, Belgium, Luxembourg, France, Italy, Spain and Portugal. Snooper S600 Syrius Plus utilises the AURA database, the most comprehensive speed camera database available offering you the ability to download new camera data seconds after it has been recorded in the database. As well as the UK, the AURA database allows your Snooper S600 Syrius Plus to cover most of Europe. Included in AURA database are locations in Belgium, Finland, France, Germany, Holland, Ireland, Italy, Norway, Portugal, Republic of Ireland, Spain, Sweden, Switzerland and United Kingdom. There are 3 easy ways to pay the subscription using a credit or debit card. To download and successfully update the Snooper S600 Syrius Plus with software, sat nav map updates and/or speed camera locations via a computer you will need a PC running either Windows XP (32-Bit), Windows Vista (32-Bit), Windows Vista (64-Bit), Windows 7 (32-Bit), Windows 7 (64-Bit) or Windows 8 (64-Bit) with an internet connection. Please note: the S600 Syrius Plus, as with all Snooper products, is not Apple MAC compatible. The Snooper S600 Syrius Plus car sat nav may now have been discontinued, however a number of the genuine accessories are available to buy from ActiveGPS. Do you have a question about the Snooper S600 Syrius Plus? Submit your question via our contact page.